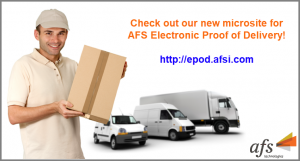 PHOENIX, Ariz. – April 12, 2018 – AFS Technologies, a leading global provider of software solutions purpose-built for consumer goods companies, is pleased to announce that it has launched a new microsite for its electronic Proof of Delivery (ePoD) software solution. AFS is a leader in the food & beverage distribution software business, offering an end-to-end consumer goods platform with solutions for warehouse management, enterprise resource planning, order management, proof of delivery, trade promotion, retail execution, mobility, analytics, customer management, and more. Founded more than 32 years ago, AFS has established itself as a market leader serving a plethora of the top food and beverage consumer packaged goods (CPG) companies in the Forbes Top 100 list, including 7 of the Top 10. With more than 1,300 installed customers on a global basis, AFS solutions drive value across a range of companies including Tier 1, 2, and 3. The new microsite at http://epod.afsi.com explains how ePoD can drive efficiency and customer satisfaction in your business. The microsite contains short videos, blog posts identifying the key features of ePoD, and links to AFS specialists and related LinkedIn sites. The site also offers a digital flipbook that links to more information about ePoD and its sister products. AFS ePoD is a mobile application that enables superior results across critical business processes such as route creation/selling and loading/delivery, along with reconciliation of all route activities. Business processes related to pre-sales, deliveries, van sales, inventory management, route accounting and settlement are both streamlined and better integrated. With AFS ePoD, you can boost your operational efficiencies and maximize customer service while reducing costs and increasing your revenue. AFS ePoD is available for both Android and iOS. It is used in the field to track a product’s activity from warehouse to customer delivery, supporting just-in-time electronic delivery confirmation including signature capture, photos, and GPS coordinates. Advanced features include the ability to track truck inventory on a real-time basis and provide the detailed level of customer account information that enables your personnel to make fast and precise deliveries. AFS ePoD Office – a Web-based application used to manage in-field activities performed by the sales and delivery team, as well as stand-alone functionality (if needed) to support inventory management, order management/generation and production. AFS OMSi – a self-serve order management platform that is Web-based and feature-rich to support both home delivery and B2B business models across multiple platforms and devices. AFS ERP – an enterprise resource planning tool that manages complex sales performance deals; offers extensive bill back management to ensure money isn’t left on the table; monitors weight, code date, and lot control for full track-and-trace; and provides accurate suggested purchase order functionality to buy smarter and reduce inventory investment. AFS WMS – a warehouse management system that provides best practices for receiving goods, put-away/flow-through, inventory management, order processing, replenishment, pick/pack, loading and shipping, as well as improved labor management. AFS G2 Analytics – an easy-to-use, flexible data analytics solution with dashboards, solution tabs and supported KPIs, to access and analyze data with close to zero latency. “Management by Exception” functionality automatically alerts management to urgent data deviations that violate defined thresholds – and then offers resolution alternatives. EDI – electronic data interchange functionality to sync data between AFS software solutions and also to seamlessly integrate data with EDI partners, as well as sharing product data among manufacturers, distributors, and retailers. AFS Technologies (AFS) is a leading provider of software solutions purpose-built for consumer goods companies. We are committed to generating improved outcomes at the point of purchase coupled with generating efficiencies in trade spend, retail execution and supply chain. With experience developed over its 32-year history, AFS serves more than 1,300 customers of all sizes in more than 50 countries around the world. The AFS products are innovative, configurable solutions that are proven to optimize your potential with automated processes, improved productivity and rapid time to value.